My project this week is preparation for J's birthday. I can't believe my middle baby is nearly 3. It seems only yesterday that she was born. I'd show you a picture of her as a baby, but Blogger and I are having some storage issues. But that is a post for another time. Some peas to go with the felt food. I just winged this pattern, and stuffed them with balls of roving. I started out by whip stitching the pods, but I didn't like the way the edges got all crinkly, (those are the two at the back). So I switched to a running stitch, which I really like. More snakes. This time I cast on 6 stitches rather than 8 as called for in the pattern, knit two rounds, increased to 8 stitches and knit another 4 rounds. I then decreased and continued as per the pattern. When I sewed the end in, I also ran it back and forth behind the head to create a more pronounced diamond shape as well. I really like them this way, and they are such a quick, easy knit that C may end up with a whole family of them in her pillow case. Joining in with Creative Friday tonight. Its time to make some Christmas presents for P. She has cut out some pictures and stuck them on a piece of paper to post to Father Christmas, so he knows what she wants. Already at 4 she wants those 'branded' things she sees on TV and in magazines. While I don't have a problem with the kinds of toys she wants - dolls, pillows etc, it does make me sad that homemade things are no longer enough for her. It makes me wonder if home made presents are slipping away. However, there are still some things she needs that I can make, and underwear will once again feature prominently this week. Check out my $2 haul from the Hospice shop, cute undies coming up. I had big plans this week to finish off a few crafty Christmas presents this week for J. However, my best laid plans have failed to come to fruition. I did manage to make a couple of pairs of undies - using my tutorial. However I also wanted to make a notebook for J, and a few clothes for her dolls. Unfortunately, she has taken her dolls to bed, so I will need to do some surreptitious measuring while she's otherwise occupied. J is probably the easiest to make presents for though. She is old enough to have definite likes, but young enough that she doesn't yet register 'branded' presents. Long may that continue. Well, I have made a couple of presents for C, so that is a good start. A little knitted snake, using Julia Stanfield's free pattern Snakes and Adders. Its really cute and easy. Instead of a pipecleaner, I stuffed it with fleece. If you're interested in how to stuff toys, Linda at Natural Suburbia has a great post about it as well. Fun fact: I have known Julia and her family since I was a very small child, but we only reconnected a couple of years ago via mutual interests in cloth nappies and knitting. I also whipped up a couple of headbands for C as well, since you can't have too many. I also thought of a present she would need - a high chair. But I'm not sure about Father Christmas giving her a high chair - it seems a little grinchy, what do you think? Aiming to get Christmas presents done in a week is crazy talk obviously, but I'll be doing my level best to churn them out. And Halloween if you celebrate it. The chore I dislike the most. Although my most popular post this month was actually my Making underwear tutorial. My bread is baked (well almost, I still have to handstitch some of them closed). Although the original instructions suggested stuffing the bread, I put 4 layers of cotton batting in mine instead. I like that its not too poofy with the batting in it, and hopefully it won't get too lumpy. I can't wait to see what felt food I'll be getting back. That's my project this week. Something that is easy to pick up and put down while waiting. And for the first time in about 4 years, I am knitting something for myself! The grown up version of the Pipitea shrug. Its tentatively called Moana, and I need to get onto it, otherwise I'll finish in the middle of summer and not be able to wear it. P requires surgery next week, and while its not unexpected (its her fourth), I am still really anxious about it. So since I do not need any further stress in my life at the moment, I am unlikely to finish blogtoberfest. I will still try to blog as much as possible, but I can't make any guarantees. or dyeing wool, with pictures. My base wool. I bought a whole bag of mystery ply wool from the Hospice Shop a little while ago. As you can see from the kinks in the wool, it was obviously from another project that has been frogged. I had about 150g of it left, and it is most likely 4 ply. First I skeined it around two chairs. It pays to make this a bit bigger than you want a finished skein of wool to be, I'll explain why later. Of course if you have some kind of fancy wool windery thing you could use that. You can just see J's hands in the top of the photo threatening to cut things with scissors. I soaked the wool in a bucket of water with about 1/2 a cup of vinegar added. I like to soak overnight, but a couple of hours will also do. Then I dumped it into the slow cooker with some of the soaking water, some warm water, and another 3/4C of vinegar. If you're mixing dyes, it pays to go easy on the vinegar, as more than 3/4C can make the dyes split, and you can get some unintended variegations. Leave it in the slow cooker (with the lid on) until the water starts to steam - its a good idea to start with fairly warm water, otherwise this takes forever. Don't use boiling water though, it might felt the wool. Because my base was grey (and I knew from past experience with the yarn that it didn't take up dye all that well), I decided to go with a greyish blueish colour. I mixed my dye together in a little container. I then dumped all the dye into the slow cooker and poked it around so that all the wool got some. I turned it down to low, and then turned it off and left the wool in the slow cooker overnight - you don't have to leave it this long, just until the water is clear. But I knew that my wool may take a long time to soak up all the dye, and I didn't need the slow cooker for anything else. I rinsed and then hung the wool up to dry. Notice the interesting purple I got from my food colouring. If you're looking for a really specific colour or combination with your dyeing, this method is not for you, its all a bit random. Remember I said to make your skein a little big initially? Sometimes when the yarn comes out of the slow cooker, it looks blotchy - all the colour on a few patches. It will always look better if you reskein it once its dry. It just distributes the variegations better in the yarn. And there you have it. Beautiful hand dyed yarn. My Mum loved it, and I can't wait to see what she knits out of it. I've cut out my felt, now to sew it all together. I have 14 slices of bread to make. I hope every one likes brown bread. A little while ago, a swap came up on the Nappy Network for felt food that I jumped headfirst into. I want to make the girls some more food for their kitchen play bucket, so this was perfect timing. 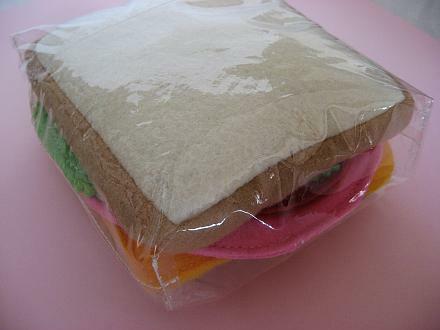 So my project this week is to make some felt bread for my part of the swap. But the possibilities are endless. Check out some of the ideas here, and here, and here. Do you make muesli? I love it. *this isn't going to end all 10 things I hate about you, I really really dislike doing dishes. I hate the way you clog up my tiny bench space, making it hard to do anything in my kitchen. I hate that I have to clean you several times a day, and that the moment there are dirty dishes on the bench my kitchen looks untidy. I hate that its such thankless work, no sooner are you washed and in the cupboard then you're being used again. I hate the contact dermatitis I get from dishwashing liquid, even when wearing gloves. I hate that you are the by product of cooking, which I really enjoy. I basically just hate doing the dishes. Our next house had better have a dishwasher. For more 12 in 2012 posts click here. This is me. I'm a pretty minimalistic kind of girl when it comes to clothes and makeup. It used to be that I was young and attractive enough to get away with it. Now, I just don't really consider my appearance all that important. Its nice to look good, but I'd rather look at my kids. There have been some other things that the girls have really liked, but the sunhats especially have been a roaring success. P wore her sunhat at kindy every day last summer (hats are compulsory, and she chose this one to wear). I even got compliments and inquiries about where I got it from the teachers. It makes me feel good every time I see her wearing it, knowing that I made something she enjoys so much. Other honourable mentions include the shrug I made P, and several of their tops. I'll let you in on a secret - I'm not really here. I am in fact swanning around on the other side of the island to catch up with my brother and family. I've set my posts to automatically publish, and since its blogtober I've been tackling that pesky 12 in 2012 list I started at the beginning of the year. Who's silly idea was that? I'm dyeing some wool for my Mum's birthday, its going to look great.